Belleville's QRF series boots were designed with the military's quick reaction force (QRF) in mind. For an armed military unit capable of rapidly responding to developing situations, shaving time off deploying is critical. This boot gets you on your way quickly with speed laces. It's lightweight and breatheable design keeps you focusing on your mission and not on your feet. For hot weather or environments where a full 9inch boot isn't needed, the Tactical Research QRF Delta B6 Men's Boot is a top contender. This boot aids in rope climbing and rappeling with a fast rope channel with high friction rubber for controlled descents. 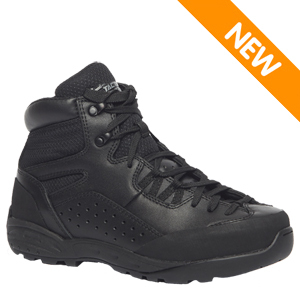 This boot is highly cushioned and features a shock absorbent EVA midsole to absorb shock and reduce fatigue. An enhanced slip resistance outsole provides excellent grip for all environments.